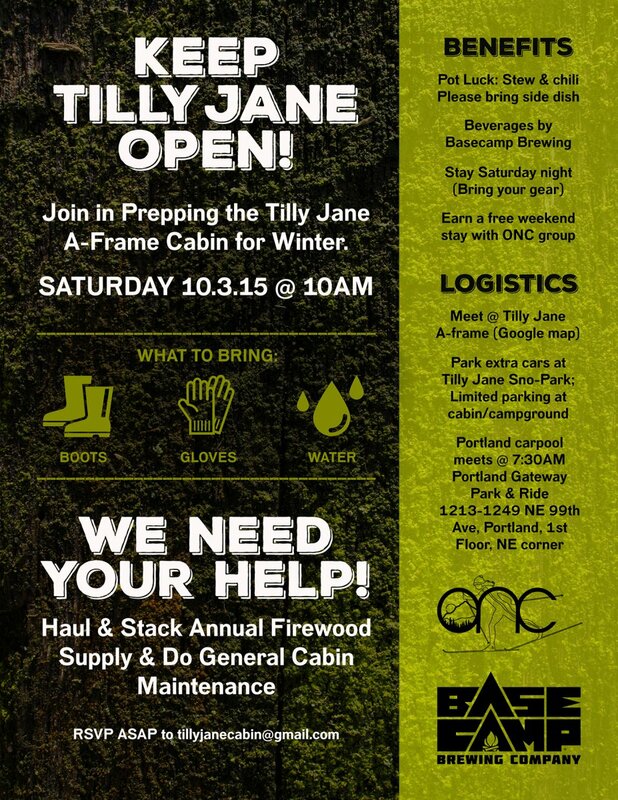 Tilly Jane A-Frame Work Party – Saturday, October 3, 2015 at 10 a.m.
Mark your calendars for Saturday, October 3, and join us in preparing the Tilly Jane A-Frame for winter use. We’ll be hauling and stacking the annual firewood supply and performing general cabin maintenance! Corral your family and friends, and do the right thing. This is your opportunity to give back and to help make sure the cabin remains open. No firewood = Cabin closure! Only you can make sure this doesn’t happen. Earn a free weekend stay during one of the Oregon Nordic Club's designated club weekends (January through April). Food and beverages will be supplied. FREE beer supplied by our friends at Base Camp Brewing Co. Food will include chili, stew, and other light lunch items. Please consider bringing something to share and/or bringing your own lunch if you have special dietary requirements. Spend Saturday night and stay over. The cabin and campground will be available for those who would like to extend their weekend. You’ll need to bring all necessary food and camping gear. The Tilly Jane/Cooper Spur road is OPEN. Get directions here. For those wishing to coordinate a carpool, we’ll meet at 7:30 a.m. at the Portland Gateway Park and Ride parking structure (1213-1249 NE 99th Ave, Portland, OR 97220, 1st floor, NE corner). You can also drive up and meet us on the mountain at the Tilly Jane Campground at 10 a.m. If you have multiple vehicles in your party, please consider leaving one at the winter sno-park, as the campground parking area is small. There will be lots of people in the area. Ask around and find our group (TILLY JANE A-FRAME) if you get misplaced. Bring sturdy boots, work gloves, water, and any other personal items you may need. Please RSVP if you haven’t already done so at [email protected]. This will help us in planning.